The numbers are in line with previous assessments of deaths due to the so-called "Dieselgate" scandal, which erupted when carmaker Volkswagen admitted in 2015 to cheating on vehicle emissions tests. Emissions from diesel cars rigged to appear eco-friendly may be responsible for 5,000 air pollution deaths per year in Europe alone, according to a study published on Monday. Many other carmakers have since fallen under suspicion. In May this year, a study in the journal Nature said "excess" emissions from diesel vehicles exceeding certification limits were associated with about 38,000 "premature" deaths globally in 2015. The new study, published in the journal Environmental Research Letters, focuses on the perils for Europe. The researchers from Norway, Austria, Sweden, and the Netherlands calculated that about 10,000 deaths in Europe per year can be attributed to small particle pollution from light duty diesel vehicles (LDDVs). Almost half of these would have been avoided if emissions of nitrogen oxides (NOx) from diesel cars on the road had matched levels measured in the lab. Volkswagen admitted installing illegal software devices in cars that reduced emissions only for the duration of tests. If diesel cars emitted as little NOx as petrol ones, almost 4,000 of the 5,000 premature deaths would have been avoided, said the authors.The countries with the heaviest burden are Italy, Germany, and France, the team added, "resulting from their large populations and high share of diesel cars in their national fleets." Touted as less polluting, the share of diesel cars in Europe rose fast compared to petrol since the 1990s, and now comprise about half the fleet. There are more than 100 million diesel cars in Europe today, twice as many as in the rest of the world together, said the study authors. Diesel engines emit less planet-warming carbon dioxide than petrol ones, but significantly more NOx. 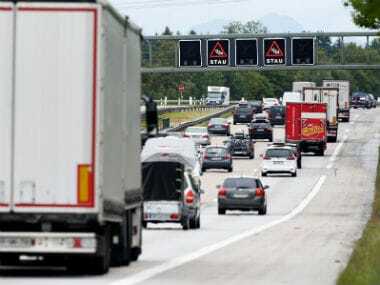 Road transport, said the study authors, contributed about 40 percent of NOx emissions in the countries of the European Union plus Norway and Switzerland. Composed of nitric oxide and nitrogen dioxide, NOx gases contribute to acid rain and suffocating smog. Through long-term exposure, they can cause breathing problems, eye irritation, loss of appetite, corroded teeth, headaches, and chronically reduced lung function. "Excessive premature deaths will continue into the future until LDDVs with high on-road NOx emissions have been replaced," said the study authors. Earlier this month, tougher emissions tests came into force in Europe.